New cockpit seating 2016 c/w embroidered sealine logo to backrest. Large double helm seat / L shaped seating with locker under Teak deck flooring (self draining) (Vinyl replaced 2016 c/w embroidered sealine logo). All seating and sun bed reupholstered c/w sealine logo 2016. One of Sealineʼs best and most popular boats ever due to the well designed spacious layout giving the same feel & accommodation as of that a 50 ft boat. (Known as the Tardis in the trade) Large Fwd and Aft cabins with hanging wardrobes and many drawers and lockers. Both cabins have their own en suites. The master aft cabin having its own separate shower compartment along with its large master island bed and large mirrored vanity unit with drawers. The dinette & Saloon also both convert to another 2 double beds giving a total of 4 double beds, sleeping 8 guests in comfort on both sides. The large sweeping Saloon seats 8 guests and large dinette seats 4, Internally entertaining 12 guests in comfort. The external cockpit & flybridge seating also accommodates these 12 guests & more. This well maintained F43 can only be described as immaculate condition. Having been fastidiously maintained and cared for with endless hours time & care with regular maintenance. Much recent works being completed during 2011-2012 and further works have been completed prior to sale to present as ongoing works are completed. This must be the best value F43 on the market today. Fitted with not only a comprehensive level of specification but the right color decor options including many factory extras requested at the time of build to tick all the boxes, Including many bonus T-series extras. Along with works of many other extras installed since build. The vessels cosmetic presentation will exceed expectations and must be seen to be appreciated. Fully documented with original Sealine owners pack including every document and manual & installation instruction for every piece of equipment ever fitted to the vessel at the the build to present. Also included is the original owners manual, Works order specification, build sheet, vat invoice, ce certificate / badges & plaques. 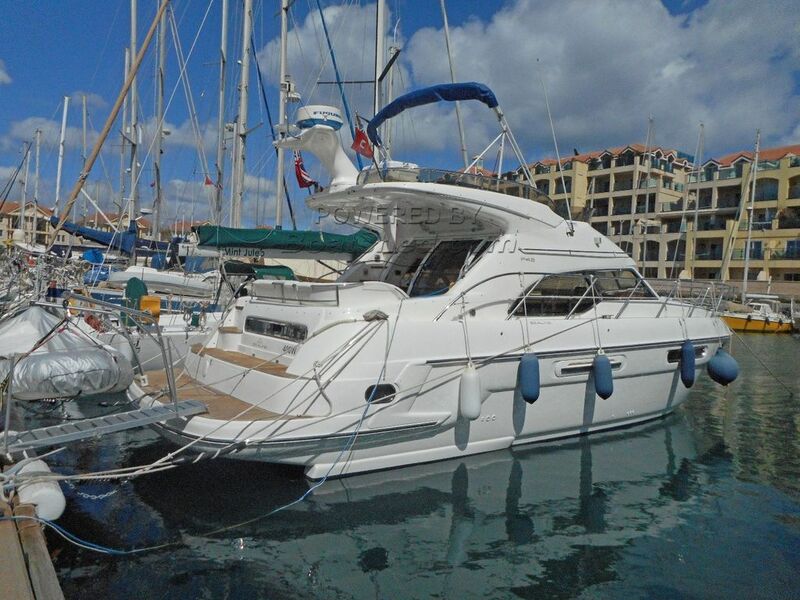 This Sealine F43 has been personally photographed and viewed by John & Lynda of Boatshed Gibraltar. Click here for contact details. Have phoned you today left message 02920899222 Uk. Please phone me.